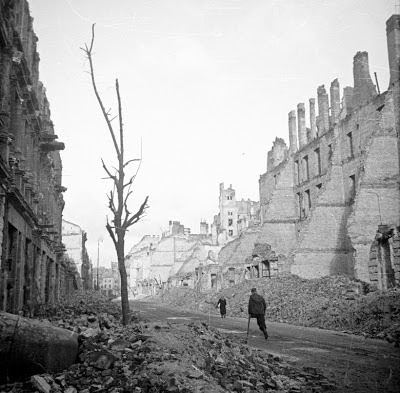 Krucza Street, Warsaw, 1945. Photograph © Edward Falkowski/Forum/Getty. I have posted here periodically on the sorts of convergences - the ways that photographers replicate each other's images - that Geoff Dyer discusses in The Ongoing Moment. Today The Guardian offered the image above as it's Picture of the Day to commemorate the liberation of Warsaw. Their caption reads: "A photographic highlight selected by the picture desk. On 17 January 1945, Warsaw was liberated from the Gerrmans by the Red Army and the 1st Polish Army. They found a completely devastated city. 2,000 Jewish survivors were found in underground hideouts but only 174,000 people were left in the city, less than six per cent of the prewar population." The folks at The Guardian seem to see this as symbolizing a liberation. While that is plausible, I have a somewhat different take. This day might arguably be seen as signalling something like the inception of the post-WWII Soviet empire. 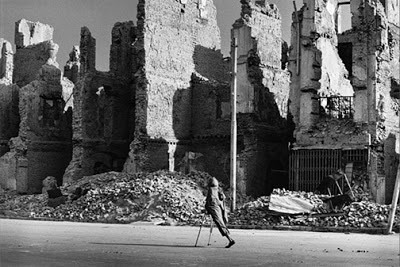 When I saw Falkowski's image, I immediately thought of the photo below, which I see as emblematic of the demise, a half century later, of that same empire. Kabul, 1996. Photograph © Sebastião Salgado.